Know someone who admires Lincoln? 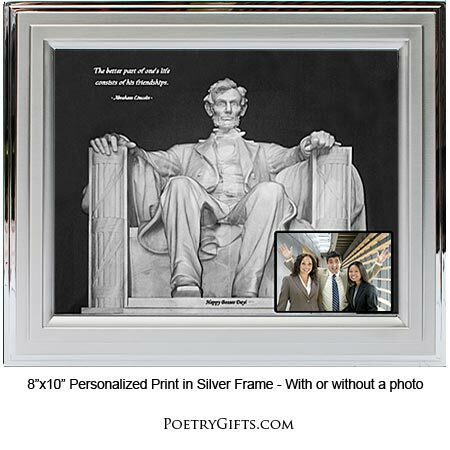 This stunning print of the Lincoln Memorial sets the tone for a unique Poetry Gift. 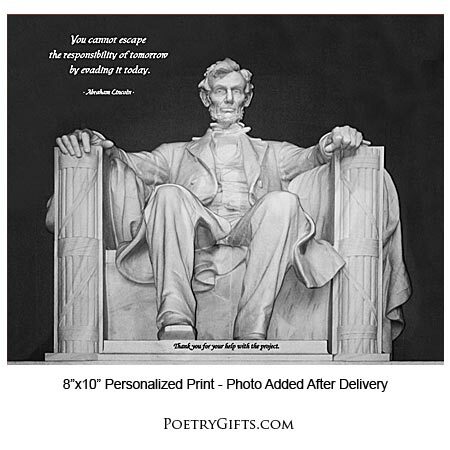 Choose a favorite Lincoln quote and personalize with a phrase at the bottom of the print and an optional photo. Does your boss have a favorite Lincoln quote? This personalized gift for your boss can be displayed in the office. The gift can be from one person or the whole department. 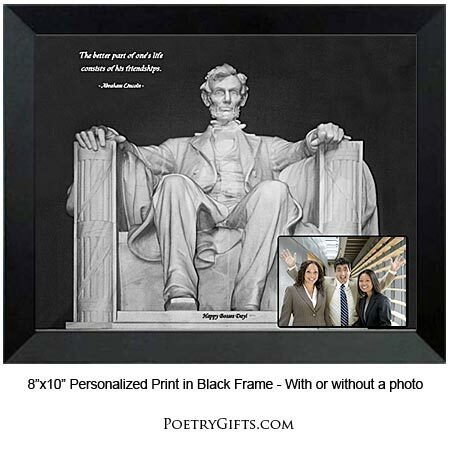 It also makes a unique birthday, graduation or inspirational gift for anyone who loves Lincoln. Quote #1 - I am not concerned that you have fallen; I am concerned that you arise.Quote #2 - The better part of one's life consists of his friendships.Quote #3 - Determine that the thing can and shall be done, and then we shall find the way.Quote #4 - You cannot escape the responsibility of tomorrow by evading it today.Quote #5 - I never had a policy; I have just tried to do my very best each and every day.Quote #6 - I do not think much of a man who is not wiser today than he was yesterday.Quote #7 - People are just as happy as they make up their minds to be.Quote #8 - The best way to predict your future is to create it. 2. Optional Closing Phrase and Your Name(s) (as seen on bottom of print) - (Examples: Thank You For Your Help On The Project, Mark; From The Staff; Congratulations, Uncle Steven & Aunt Becky; You Can Do It - Lisa; Don't Give Up - Sam; etc.)" Quote #1 - I am not concerned that you have fallen; I am concerned that you arise. Quote #2 - The better part of one's life consists of his friendships. Quote #3 - Determine that the thing can and shall be done, and then we shall find the way. Quote #4 - You cannot escape the responsibility of tomorrow by evading it today. Quote #5 - I never had a policy; I have just tried to do my very best each and every day. Quote #6 - I do not think much of a man who is not wiser today than he was yesterday."